Without realizing it, we may be honoring the Norse Goddess Freya every week, on Friday, "Freya's day". This may also be the long forgotten reason that fish was a traditional meal on Fridays. Freyja was the daughter of the sea god Njord, and like the ocean goddesses Aphrodite and Mari, was a goddess of love, associated with the ocean and fish. 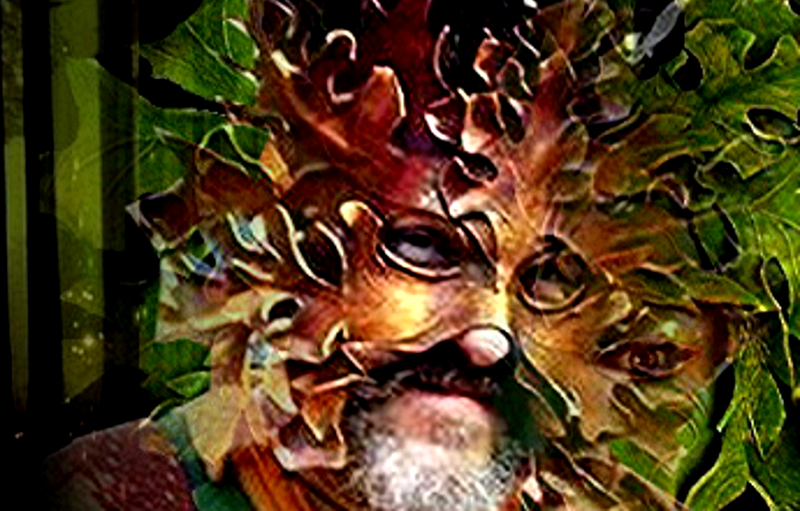 Freyja flew over the earth and wept tears which turned to amber. Amber is sometimes called "the tears of Freyja". 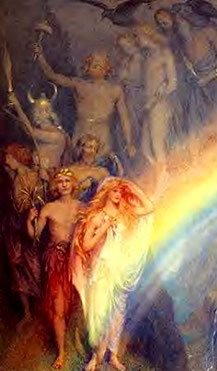 In classical art, Freyja is sometimes shown with the Gods and Goddesses of Valhalla on the "Rainbow Bridge", coming and going to the earthly realm. Freyja's greatest treasure was the Brisings' necklace. The Brisingamen necklace was crafted by four dwarfs with such artistry that it glittered like a constellation of stars in the night sky. Around Freyja's lovely neck it became an emblem of the fruits of the heavens and earth. Freya wears "the jewel whose power cannot be resisted." Brising meant "fire", specifically the fire of an enlightened mind. The winter constellation we today know as Orion was called "Freya's Gown" by the Norse and Teutons, and the sword belt in Orion was "Freya's Girdle." pre-patriarchal deities, which may account for Freyja's association with the cycle of life, from birth and sexuality to death. The Vanir became supplanted by the younger Aesir, but in earlier mythologies, she was all-encompassing in her attributes. She was the patroness of women who attain wisdom, status, and power - the Valkyries - ordinary women who became priestesses and warriors. The Valkyr at last became Norns, the Goddesses who weave the fates and histories of people and of nations. As chief Valkyrie, Freya's origins may indeed be among the much earlier Goddess religions of Old Europe. Freyja could fly in a chariot drawn by two cats, and she is associated with the love of cats. "Love is one of those treasures where the gift and the reason for giving are one and the same. When love is given freely, its existence becomes self-fulfilled, needing neither acknowledgment or permission to live on. The people of the Norse peninsula and Iceland gave expression to this inexplicable force in their lives in the Goddess Freyja. Honored as the Goddess of love, Freyja was called on to assist those who needed to bring the magic of love back into their lives. 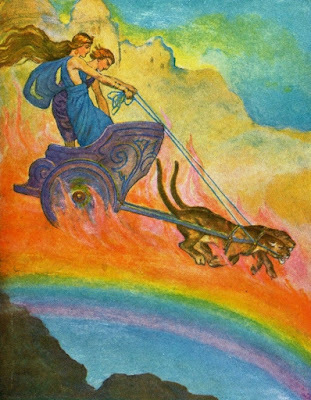 Freyja's inspiration led the way from one age to another, as new discoveries replaced old beliefs and methods. Freyja symbolized the shift form wood to iron, an inevitable transformation, that brought both happiness and pain. Imagine the people of the north singing her song while sharpening their swords and tending their iron cooking pots that fed their families. Through it all Freyja was the muse for transcendent love. She cherished and sometimes cried golden tears over the death of her husband, Od, one of the gods of ecstasy. You can still see Freyja in the night sky wearing her favorite necklace made of precious metals and gems. Only now she has become known as the Milky Way. Calling on Freyja, you acknowledge the love that lives on, from age to age — from the very earth's beginning, beyond today, and into the infinite future. Asking for the strength to love, even when the outcome is uncertain, you draw on a power that illuminates and transcends this moment. Bring to mind a situation you want to infuse with love's embrace. Ask Freyja to help you find the source of your heart's desire, for she embodies the enduring power of love in your life. Let the thoughts and feelings that arise be your guide."